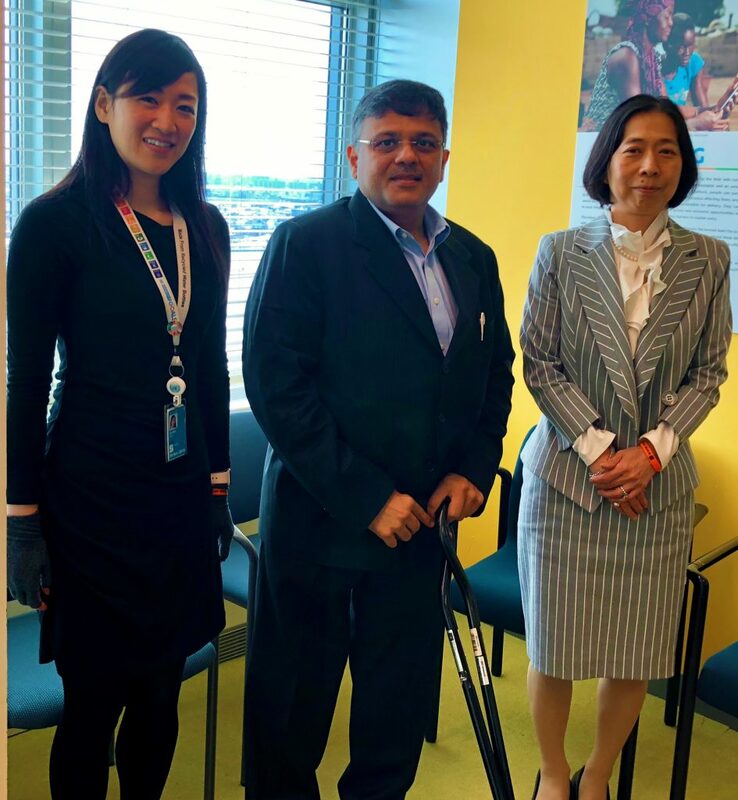 Founder of US based non-profit Voice of Specially Abled People, Pranav Desai met at United Nations (UN) with Dr Akiko Ito, Chief of Secretariat for the CRPD (Convention on the Rights of Persons with Disabilities), Department of Economic and Social Affairs and team – Saeko Kajima and Lilibeth Benitez. He presented Voice of SAP’s India centric vision, Model, impact and strategies to achieve inclusion and Empowerment of Specially Abled People. He explained how VOSAP mobile app has empowered individuals to perform their ISR (Individual Social Responsibility), create mass movement and generate crowd sourced data on building accessibility. As of now close to 4,000 volunteer pledges have been taken and the community of volunteers is growing with help of VOSAP mobile app. He explained VoSAP’s Govt. Connect program to UN team. For last 4 years, Voice of SAP has been working with Govt. of India and its ministries, state and local governments and that has helped create comprehensive India model which includes structural reforms such as new law for Persons with disabilities, disability policy, universal accessibility standards, national launch of Accessible India Campaign by H’ble PM of India etc. This has seen significant increase in budget allocation for programs in urban development, education, healthcare, social welfare, railways etc. India model also includes VoSAP’s Corporate Connect program, which includes conducting sensitization workshops with corporate leaders, employees to take VOSAP pledge so that companies start working towards creating accessible offices, hiring Persons with Disabilities, allocate funds for CSR activities etc. UN team liked this and connected to ILO, India to expand this program with MNCs. Pranav emphasized on how grassroots level efforts of VoSAP is inspiring thousands of college students (Nirma Uni, Gujarat Vidyapeeth, Gujarat University etc. ), who have started to “Think Inclusively” and motivated to be the “Change Maker” in their community using VOSAP mobile app. UN team highly appreciated 360 degree approach to achieve inclusion for Persons with Disabilities and particularly the innovative technology solution (VOSAP mobile app) to create local communities of VoSAPians, worldwide who network, support each other. The world is built for “Abled” people. It is last 50 years that efforts have started to mainstream Persons with Disabilities. As of today, we do not have information about building accessibility as where a wheelchair user can go but we all can help them by taking picture of building entrance within VOSAP app, giving star rating based on accessibility provisions. Everyone can see those pictures on map in the VOSAP app. Volunteers can also become activist for inaccessible buildings by using integrated features in the app for sending email to authorities, building owners, sharing in social media so that people are made aware, come out in support to strengthen the voice for upgrading those buildings for accessibility. Essentially, UN CRPD team is inspired for the possibilities with highly engaging VOSAP mobile app and replicable India model, together represents a huge global opportunity to accelerate achieving UN goals of CRPD, which 177 countries have accepted since 2006. Subsequent to this UN meeting, Pranav Desai is invited to present VoSAP mission to Conference of State Parties to the CRPD (COSP)) at UN by organizing a side event.